....no services will be held as was Bill’s wishes. William ("Bill") Rossiter Waters passed away peacefully at his home in Stuart, FL, on the morning of March 14, 2013, after several months of declining health. He was 94. Born on February 3, 1919, in Montclair, NJ, he was the son of Rossiter Lester Waters and Katherine Wilson Morrison Waters. Bill grew up in Sea Bright, NJ, and was graduated from The Lawrenceville School in 1938. He left university to attend a federally sponsored flight training program and eventually became an instructor. He joined Northeast Airlines as a co-pilot shortly before WWII. When war broke out he joined the Navy where he flew transport planes for the duration of the war. 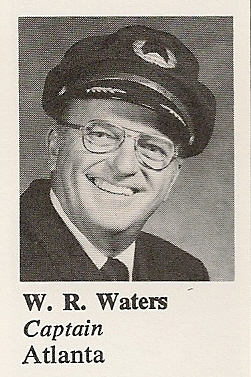 He returned to his career at Northeast Airlines (later merged with Delta). He quickly rose to Captain and was eventually qualified in virtually every aircraft owned by Northeast and Delta Airlines from the DC3 to his retirement on the L1011. He continued his involvement in flying well into his 80s, 36 years as a commercial pilot and another 25 years in private aviation. He closed his log books with over 30,000 hours logged. He was a proud member of the Quiet Birdmen, SUA Hanger. Bill always had a good story, enjoyed a good laugh, and drove his 3-wheeled motorcycle into his early 90s. He is survived by his 7th wife, Joan, 7 children, 7 grandchildren, and 17 great grandchildren. At Bill's request, no services will be held. His ashes are to be interred at the family cemetery in Connecticut. If words could sum up Bill's life: He never met a woman he didn't like. Word has been received that NEA/DL retired pilot and Delta Pioneers member Captain William Rossiter Waters has passed away at the age of 94. Bill hired on with Northeast 06-08-1942 and retired at the mandatory age 60 in 1979. To date I have not been able to locate an online obituary. Arrangements are not yet known. I have been informed that Bill Waters passed away on 14th of March at his home in Stuart, FL. Bill was 94 yrs. old.